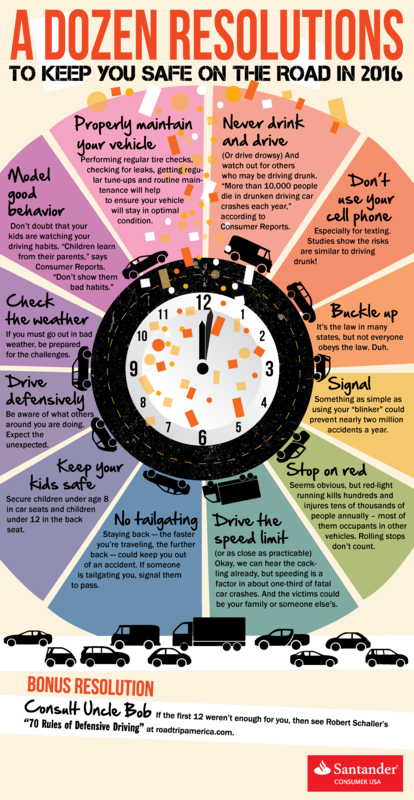 Why not resolve to make some changes in your driving habits that are easy to accomplish and could have a big effect on the safety of you and your family in 2016? So, in that spirit, we’ve put together an easy-to-digest – if not always easy to keep – list of a dozen resolutions for your new year. Make sure your resolutions are things you really want – like keeping yourself, your family, friends or other passengers safer in your car. Limit your resolutions to a manageable number, so even if a dozen seems like a lot, think in terms of working on one or two a month until you’ve accomplished them all. Make your goals as specific as possible – rather than simply maintaining your car better, schedule tire checks, oil-level checks, tuneups, windshield wiper and fluid checks, etc. Change your habits, if necessary, such as using your turn signal when entering traffic or changing lanes or buckling up your seatbelt every time you get in the car. Visualize your goals regularly by keeping them in a prominent place – a desk, table, mirror or refrigerator – something we’ve made easier for you by compiling the graphic above. Share your resolutions with friends and family who will hold you accountable, share your progress on accomplishing your goals, and reward yourself when you do. Don’t give up if you slip. Any goal worth achieving is liable to come with setbacks. Rely on your friends and family to keep you focused throughout the year. Now that we’ve help set you up for success with your New Year’s resolutions, the only thing left to do is to wish you a happy, healthy – and safe – year ahead from Santander Consumer USA.